I can't explain how excited I am to sit down and write this post! 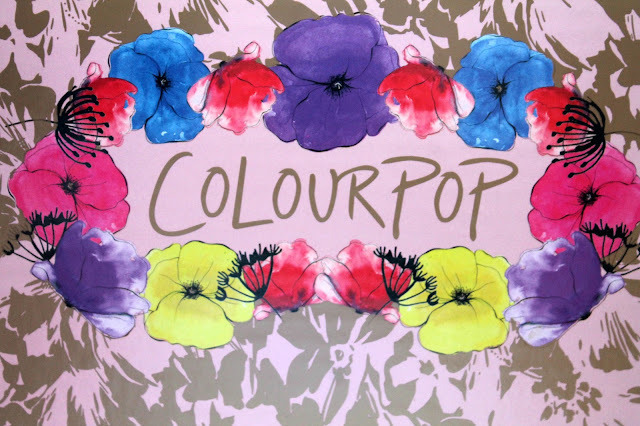 As soon as Colourpop announced that they'd be introducing international shipping (July 12th 2016), I knew it wouldn't be long until I made my first order. Although I have many products on my list that I want to purchase, I decided to start off small to avoid any high custom charges. I placed my order two weeks after their international shipping went live and as much as I'd searched around, I couldn't find any reviews on people's experience with UK shipping. 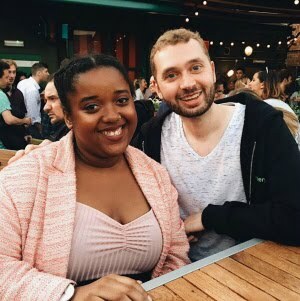 So hopefully this post will be helpful to anyone considering making an order from the UK. My ultimate goal is to own every shade that I think will suit me in the Ultra Matte Lip range. Right now, I have a full basket of all the shades that I desperately want to get my hands on! I'm just waiting until I win the lottery so I can go to the checkout... hopefully that'll be any day now. Ha. Also, I'm hoping to try out some of their eyeshadows and highlighters as I've heard wonderful things. 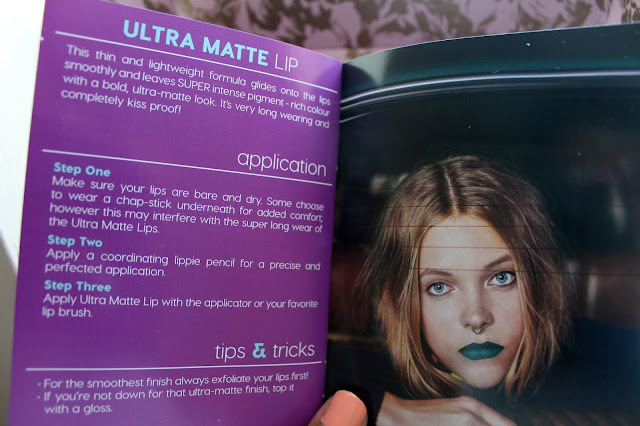 I currently own 'LAX', 'MARS' and 'SOLOW' from the matte lip range, all of which I reviewed here last month. 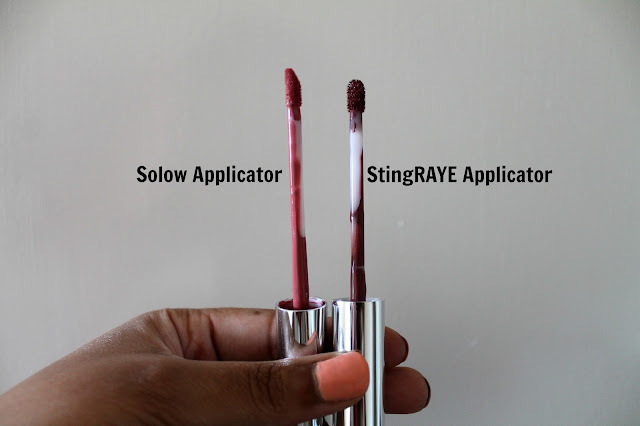 As soon as I tested out these new beauties, I instantly noticed a difference in the applicator wand compared to the ones that I owned previously. You can see in my last picture that the 'Solow' wand has a bit of a slope and isn't as fluffy whereas 'Bumble' is a little smaller and much fluffier. I definitely prefer the newer wand as it is easier to apply on my lips. 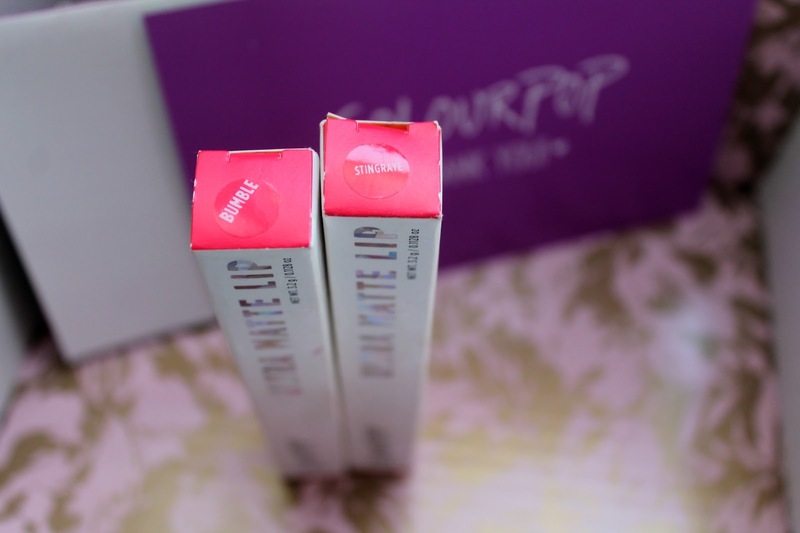 It glides on beautifully and feels much more comfortable unlike the previous wand, which picks up a lot of excess product around the lips. StingRAYE/ This was probably the shade that I was most looking forward to arriving as I have wanted it for ages! I have very mixed feelings towards it. On the site, it's described as a 'mauve brown' tone. The best thing about the Colourpop website is that they include swatches of their shades on three different skin tones, which gives you an idea on which lipsticks will complement your skin tone. Having said that, SR didn't look like how I'd imagined it to be. It just looks very purple against my complexion and does not seem to have any hints of brown. I also let Ally try it on and I have to say that I was pretty jealous. Not only did it look so gorgeous on her, it looked exactly like a mauve brown. I'm over it though! This is just something that's bound to happen with lipstick. Every skin tone is different so it was a bit silly of me to expect it to come out looking identical. I'm not that disappointed with it, I just don't think that it'll be one of my go-to shades. However, that could all change with a little blending of other lippies. 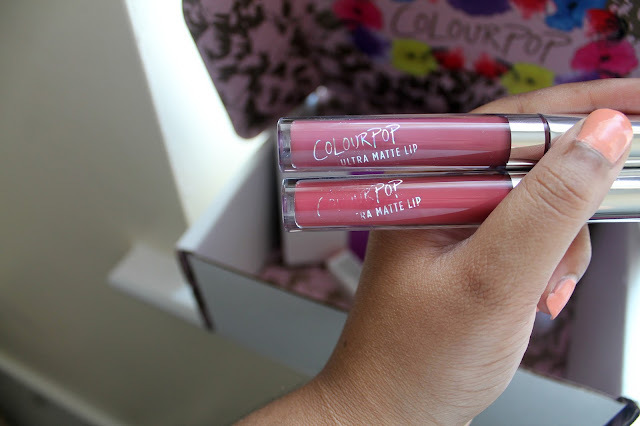 Overall, I do like this product as it is a colour that I've never owned before. I actually just found out that SR is being discontinued from August 12th, as it's part of a collab shade. So get your orders in quickly if it's currently on your list! Bumble/ An absolutely beautiful dark pink tone. For me, it actually has quite a few similarities to my MUA Velvet Lip Lacquer in 'Dash' but it is a little darker. All summer I've been obsessed with wearing pinks and have really built up quite the collection. Last Thoughts? 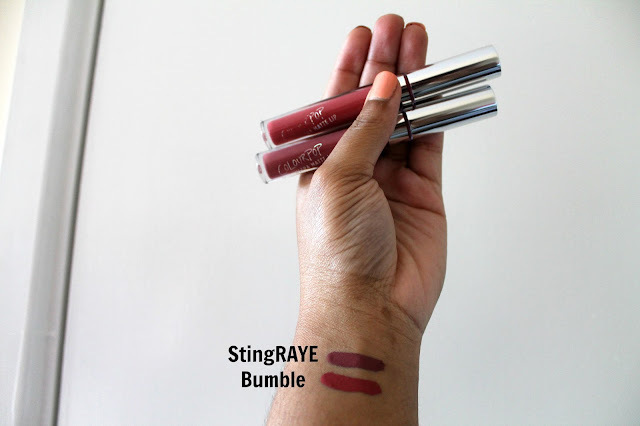 Both 'Bumble' and 'StingRAYE' are so easy to apply on my lips. As I stated in my previous Colourpop review, I don't find the formula to be drying at all. It still shocks me at how much product stays on the lips throughout the day, even when a lot of food and drink has been consumed throughout the day... So basically perfect for me as I'm always stuffing my face! another quick thing that I just wanted to pick up on was the writing of 'COLOURPOP Ultra Matte Lip'. 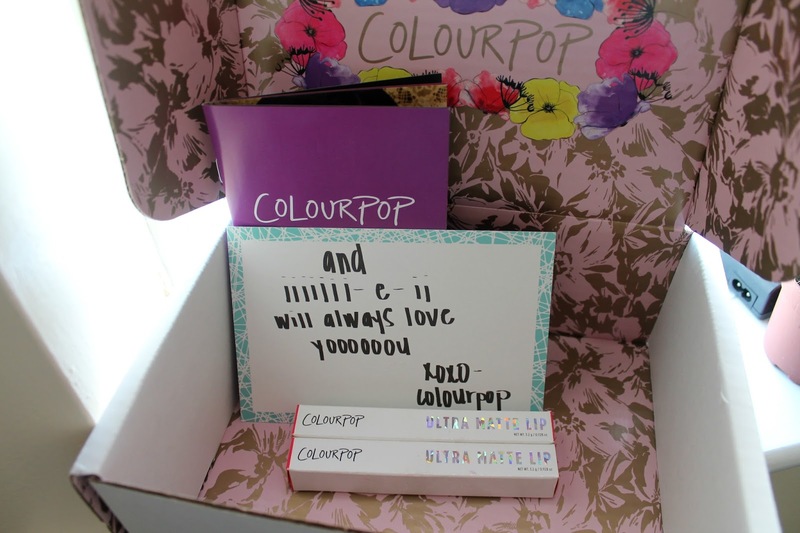 It rubs off so easily but I'm really hoping that Colourpop have picked up on this and found a way to make it last on each bottle. UK Shipping? Shipping rates vary for UK shipping. I was charged $15 (£11.48) with no custom charges. I've since seen a few other people discussing their orders and I believe that shipping varies from $15 to $25 depending on the quantity of your package. I only had two items in mine so it was classed as a small package. I am aware that custom charges can be put on no matter the size of your package (I have been told that it depends on the items rather than size) but I'm pretty thankful I didn't have extra fees. The whole process was just so simple and stress free. I've never ordered anything from anywhere but the UK so I was worried that it would take forever to arrive. However to my surprise, it arrived exactly a week after I'd placed my order which I think is amazing. I was given tracking information and requested email updates so I could follow every movement of my package. I'd say that is outstanding customer service. Are you a fan of Colourpop? Have you/are you considering making an order from the site?